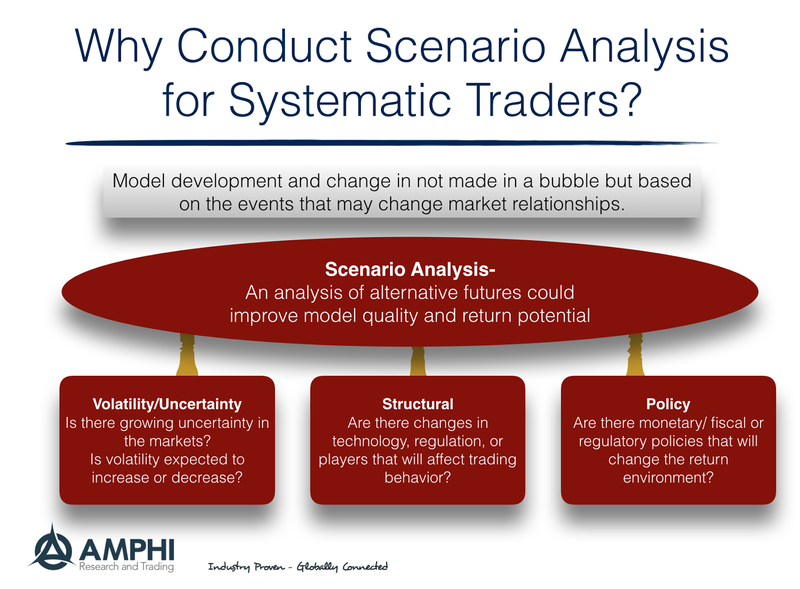 Many may think it would be strange to undertake scenario analysis if you run systematic or quantitative shop, but in many cases, it is all the more important because it sets the agenda for futures research and may identify alternative environments when model performance will be an outlier either up or down. While many view that systematic decisions are mainly run from a model, there are a large number of qualitative decisions that have to be made from the model-maker. The choice of models, the weights for risks, portfolio exposures, leverage, the introduction of new models, the research agenda all require some human decision based on the preferences of the manager. 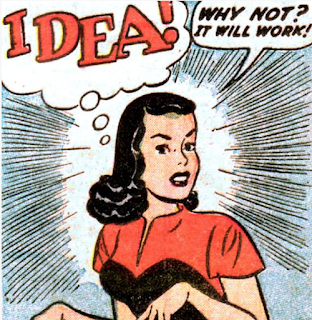 Even attempts to systematize as many decisions as possible require some initial modeler preferences. We think a regular scenario analysis review can help with the process. 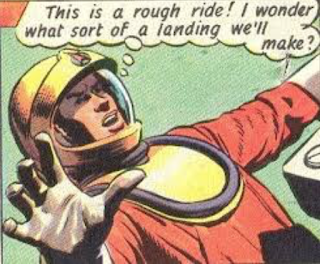 At one extreme, scenario analysis can just be used to identify areas for new research. Alternatively, scenario analysis may help tilt the exposures of models, markets and sectors. The objective is not to develop scenarios of actual prices, but form scenarios of what the environment may look like. What are the alternative investment worlds that we may inhabit. For example, with the BREXIT vote, the UK will be at best a more uncertain investment or one that shows increasing downside risk for domestic companies. This may change the quality of signals relative to historic back-testing. We divide the scenarios for this type of analysis for systematic traders into three major areas or focal points for discussion: volatility/ uncertainty, structural, and policy scenarios. For volatility and uncertainty, the scenario question is simple. Are we going to be in a high volatility or low volatility environment? Similarly, is the markets going to face more or less uncertainty? These questions will lead to cases for what will have to happen to make the market remain or move to a new state. Walking through what would have to happen to change the state and the likelihood of that event is critical for good portfolio management. Structural scenarios are usually more long-term. What is the state of trading fin-tech? Are there regulations that will change the competitive landscape for trading? Will there be a change in the major players in the markets traded? Will competition for alpha increase over time? If the costs of trading increase, it will impact some strategies more than others. Structures matter. Policy scenarios are always a key focus for any research. Will central banks change their monetary policies? Given the radical changes over the last eight years, the impact on models and systematic behavior will be strong. Will there be changes in fiscal policy or regulation that will change the macro environment? Certainly, a move to fiscal stimulus will change economic growth prospects and affect relative sector performance. Models are sensitive to the environment on which decisions were tested, so preparing for changes in the environment is a very useful risk management tool independent of price forecasting. The nature of how this is done can be highly variable and individualized to the culture of the firm, but undertaking future scenarios seems to be a critical responsibility of the manager. 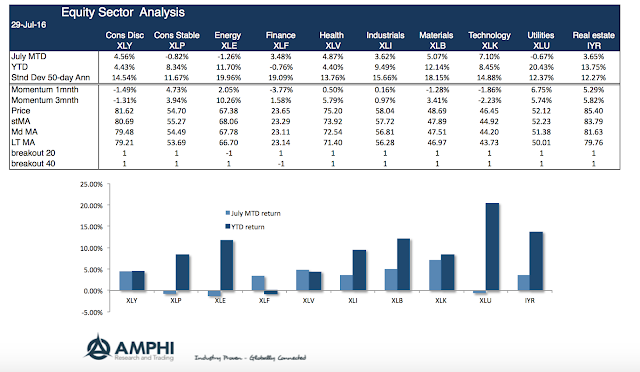 Equity sector behavior has continued to perform well in July with the only exception energies (XLE), consumer stables(XLP), and utilities (XLU). The best performing sectors have been technology, materials, health, and consumer discretionary. Technology and consumer discretionary improved even though they have been at the bottom of our 1 and 3 month momentum measures. Prices are above short-term, medium, and long-term moving averages in most cases except for energy and finance. We also follow simple breakout rules for 20 and 40 day and find that most sectors sector showing prices above the look-back prices. Currently, there is no information to suggest a dislocation from the current trends. 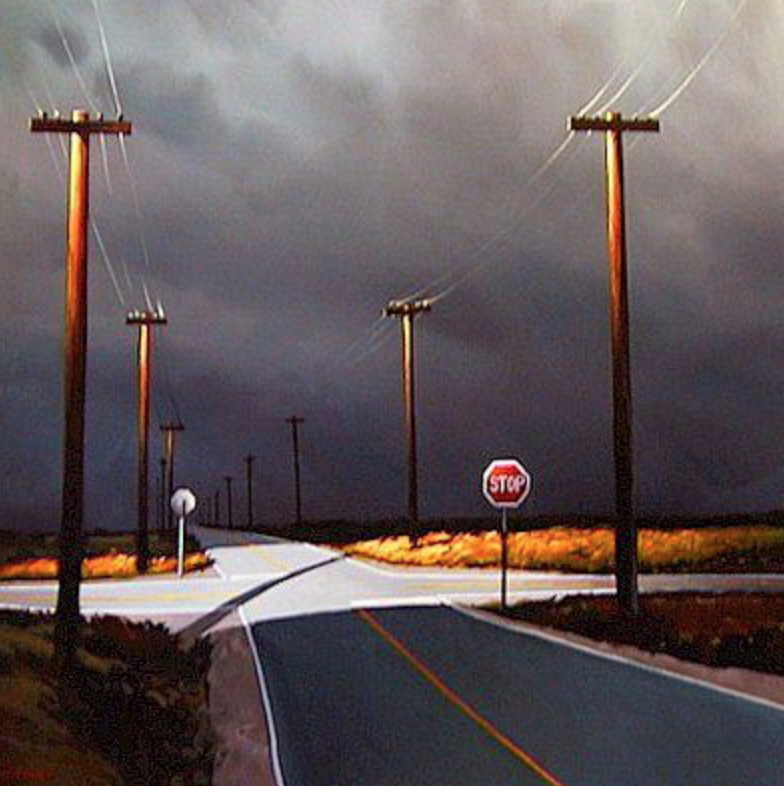 The markets are not at a crossroad. 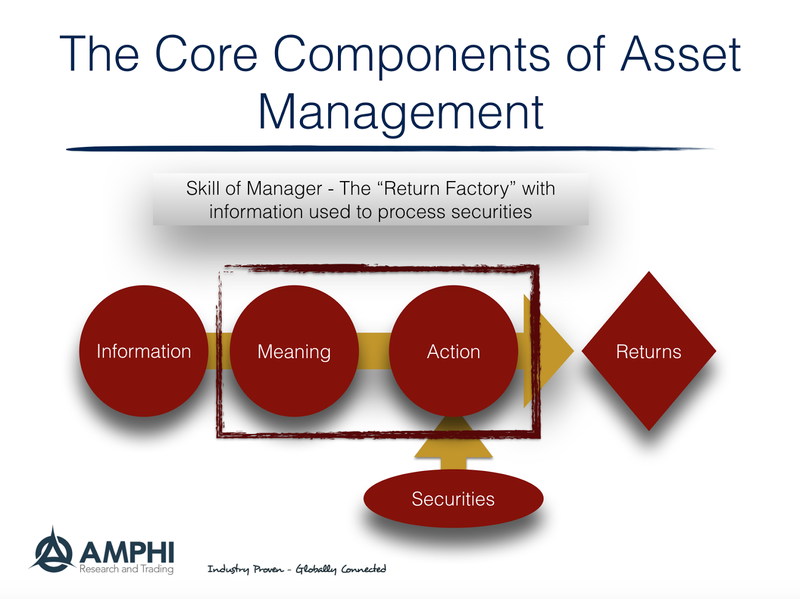 To understand asset management, you need to break it down into its core components. This idea of core components is not about a specific style but something more primal. Think of asset management like a return factory. Like any factory there has to be inputs and processing. The raw input is information for return generation is information. However, information by itself may not have value until it is processed or given meaning. The asset management finds information useful only if it can be given meaning. There is a lot of information that is noise and may be of little value to one manager but valuable to another. The skill of the money manager is his ability to give meaning to information. The manager forms expectations or beliefs on security returns. If a manger cannot generate meaning from information, then it is better to be passive. However, meaning does not generate returns unless there is some action or decision. The meaning has to cause or be linked to action or it does not have value. Some may be very good at applying meaning to information, but if there is no action, there is no return. The other inputs with information are securities. These securities have different characteristics such as risk premium that may be grouped together, but information, meaning, and action have to be combined through a vehicle - the security. The security will change in value based on new information and the action of the managers. This primal breakdown is important because it can focus on what are the key skills of the manager. What is the information that the manager uses? How does the manager apply meaning to this information? How or when does the manager take action on the meaning to the information? Information is generally available, so the comparative advantage of the manager is usually not with the information, but rather with the processing of the information to extract meaning. Good analysis or meaning is not enough. There has to be action through the explicit buying an selling of risks. No action, no returns. This simple three part framework focuses the functions of money manager into core components that apply to all strategies. While there has been optimism about a resurgence in the commodity markets, a closer look at the data suggests that caution is warranted. First, each commodity market is often different. There is no common market factor that generally drives these markets. Second, any trends are often dampened by the fundamentals which are inconsistent with the price action, so basic supply and demand has to be reviewed if you want to get the longer-term direction right. At the core, momentum and trend are still the best signals for commodities trading but linking to fundamentals will help manage risk and expectations. A perfect example is the wheat market which is down more than 20% this year and has been in sustained downtrend since the middle of 2012 in spite of some short-term up trends. The fundamentals give a good story for the trends. The fundamentals are holding back any sustained rally as seen through four charts from the USDA ERS commodity yearbook for global wheat. First, production has continued to rise. 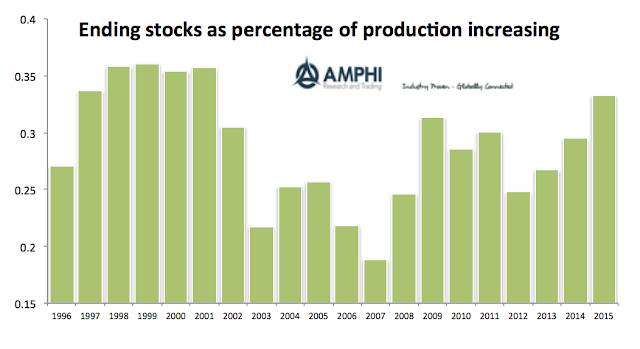 Wheat had a good showing in 2012 when production fell, but world production is now just off global highs. Second, yields are increasing. Productivity continues to march higher, so the same amount of wheat requires less land. Technology drives real prices lower. 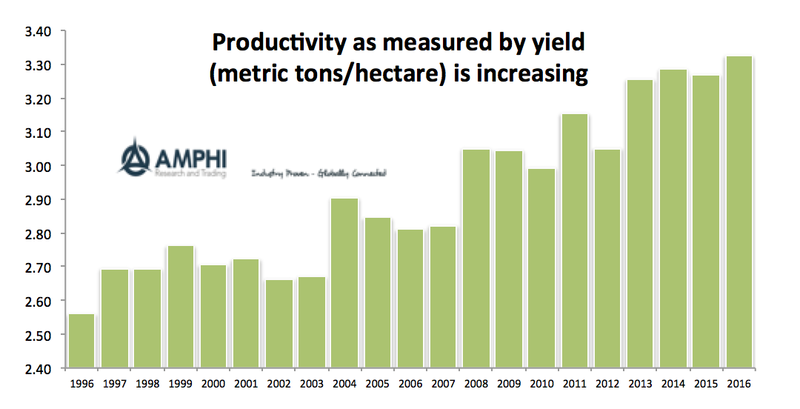 The combination of production and yields suggests that no shortage is likely in the near-term. Production has to be matched with demand or end usage, and if there is an imbalance, the residual will be placed in storage, yet storage is not passive. Storage also serves as a signal of future high prices. If a market is in contango, suppliers can hold inventory, hedge and end up in a good financial place even if markets are priced fairly. Ending stocks are at new highs, so there is a strong stock buffer if production falls. The size of the buffer relative to production is strong. You have to go back to 2000 to see similar levels. Trend-followers are non-predictive and only rely on price as the signal, but a more macro approach that accounts for other information suggest caution on the long side. Alternatively, consistency of signal and fundamentals on the short-side of the market have made for better opportunities. 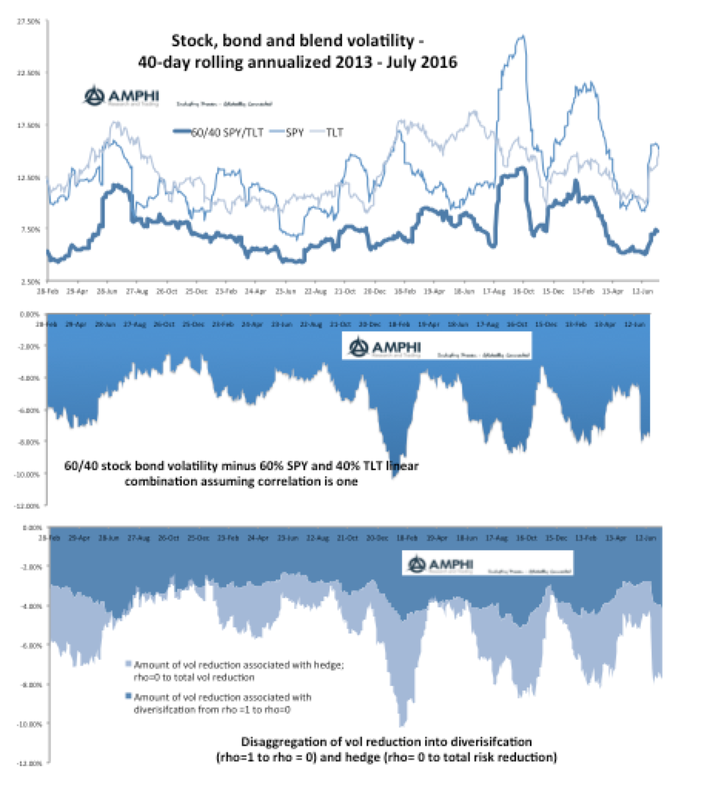 What do you really get from bond diversification in the 60/40 blend? There are more stories about how the 60/40 stock bond mix is dying. There is no question that as yields decline further there is more bond risk, albeit this has been a concern around the world well before rates went negative. That said, it is good to explore what has been the real value of bonds which has the hedging power of negatively correlated asset. We can explore this through decomposing the volatility of the 60/40 stock/bond mix. The first graph shows the volatility of SPY, TLT, and the 60/40 blend. Equities are generally the most volatile asset followed by bonds; however, the long bond has had periods of greater volatility. The 60/40 mix will always be below the two with the volatility decline being significantly below the weighted average of the two assets. Clearly, if both bonds and stocks are higher than the 60/40 blend, there is diversification benefit. If the correlation between the two was 1, the the 60/40 mix would be a liner combination of the two assets and be between the stock and bond volatility. The low volatility of a blend is achieved through the low correlation of bonds to stocks. We have discussed in the past the diversification benefits of an asset. (See Decomposing Diversification.) The gain from lower correlation can be divided into a de-correlation effect and the hedging effect. Our graphs focus on the diversification benefits through showing the impact of changing correlation. However, we want to go one step deeper by looking at the diversification caused by de-correlation which is the value added from the correlation declining from 1 to zero and the added diversification benefit of bonds being a hedge. The hedge competent is the added risk reduction from the volatility of a stock bond mix where the correlation is zero and the actual volatility of the blend. 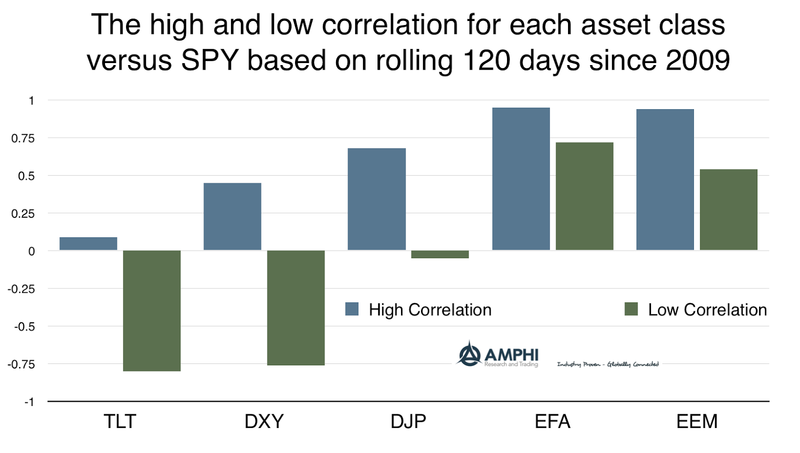 The third graph shows the risk reduction from moving between 1 and 0 correlation and then the added reduction from the hedge created by the negative correlation of bonds and stocks. This hedge component is more volatile because the correlation between stocks and bonds moves around. When the correlation is positive, there is no risk reduction from the hedge but there is still decor relation. So what are the biggest concern for the 60/40 blend? One, will bonds generate return at low yields, and two, will the diversification benefit form bonds still exist. The first is hard to predict, but we can say that if bonds no longer serve as a hedge, the risk reduction could decline by more than 50%. Investors know that the total return environment will be more challenging in the coming few years. The investment question is what can be done to minimize this decline on portfolio performance. The recent SSGA survey, "Building Bridges -Are investors ready for lower growth longer? How are they working to bridge the performance gap?" tries to identify what investors are doing to adapt and adjust to the current environment. Investors are using constructs outside asset classes to generate return. In the old world, most investors thought in terms of asset class. How much equity or fixed income exposure do I have in the portfolio? The latest survey shows that only 41% of investors use asset class as the primary method for classification within the portfolio. Now, 30% of investors use factor/exposure and 25% employ other objectives such as growth or income as the primary drivers. The focus on risk and objectives may allow for better management of the portfolio over the traditional asset class construct. There is a clear sense of measurable risks tied to fundamentals. The declining returns associated with asset class and the focus on risks and objectives has lead to changes in the construction of portfolios. The three biggest alterations to portfolios are: increased allocations to alternative investments, increased use of objective-based investing, and increased use of active investing. Coming in fourth is the use of smart beta as an enhancement technique. The premise is that active investing will offset the return shortfall. While there has been an explosion of demand for ETF's and passive investing, it seems as though pensions are concluding that hitting investment targets can only be achieved through active managing of the portfolio. Sitting on fixed or passive allocations will not get investors to their return targets. In spite of the underperformance of active management, the decline in hedge fund alpha, and the changing impact of value or growth strategies, investors are relying on these methods to make up for what they cannot receive in beta. The old-fashioned approach of better funding pensions is only the last resort. 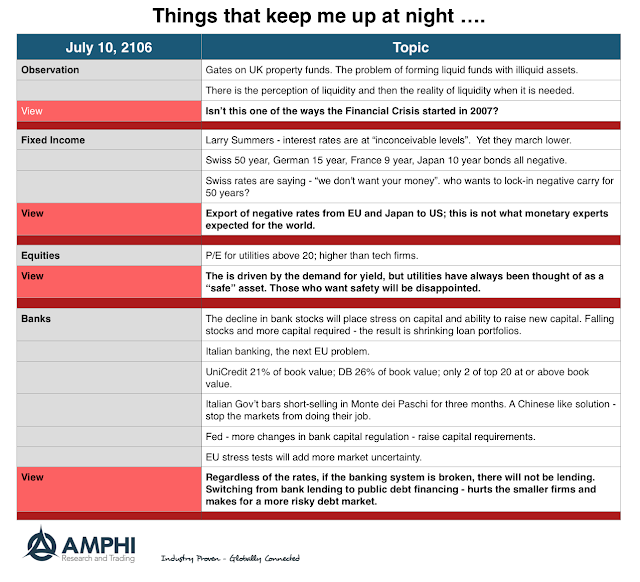 The overriding theme in "what keeps me up at night" this week surrounds geopolitical risk and the risk of uncertainty. The world is a riskier place both because of actual events and well known events that like clarity on resolution. This risk exists without even touching on the US election, yet markets continue to be in "risk-on" mode. I am not sure what it will take to switch thinking. Granted specific markets have been affected by these risks and uncertainty. We can point to the decline of sterling and small cap UK stocks after BREXIT or the fall in Turkish lira after the coup attempt, but there has been less overall anxiety which seems surprising. My concern is the overall question of whether investors should hold risk assets. Is a capital investment for five years safe under the current environment? Will earnings grow and be unaffected by these uncertainties? Will productivity of labor increase under the current environment? If the answer is no to these questions, you have to wonder why the US equity markets are at highs. On a more micro level, the impact of low rates on the rule of 72 is shocking. This has been going on for years, but it still is something that is extraordinary. It is impossible to double your money when rates are negative. The march lower of interest rates lengthens the duration of bonds. For a given move in rates, there will be a greater change in total return and there will be less cushion coming from yield. While all investors implicitly know this, the magnitude of the duration change has not ben trivial in the current environment and may surprise many. This is especially the case for longer maturity bonds. The decline in rates from before the Financial Crisis has led to an increase in the duration of the long bond by 50%. Whether rates move further toward zero or a back-up to higher levels, the price impact of that rate change will be greater than in the past. One of the reasons for the strong negative correlation between stocks and bonds is the fact that the bond price change for a given change in rates is greater. The cushion of higher yields will cause the correlation to stay closer to zero. If there is no cushion, the correlation will become more variable based on the relationship between stocks and interest rates. There is strong evidence that smaller hedge fund managers do better than larger managers. There is also evidence that managers that become popular with growing investment flows often disappoint with poorer investment performance. Finally, it is a fact that many managers underperform benchmarks and there is no persistence in returns. There should be a model that explains all of these phenomena. There is a rational models on how these results can be achieved through the normal competitive market process. There is no needs to rely on poor management skill or behavioral biases as some have suggested.A competitive model can be used to explain similar behavior with hedge funds. This competitive model can be used to help frame how investors should choose managers. I am always surprised by why some academic papers capture thinking in the non-academic world and others do not. The Berk-Green model of asset management behavior found in "Mutual Fund Flows and Performance in Rational Markets" in the July 2004 Journal of Political Economy does a great job of providing a rational model of active management that has useful insight for explaining the lack of persistence and underperformance of managers. Their thinking is even more applicable to hedge funds to help investors choose the right managers. In world where it is hard to determine skill, looking at performance is useful. Money will flow to the better managers, but in a competitive markets, these money flows will continue until returns are driven down to the industry average or benchmark returns. It make sense for managers to continue to take money in even while returns are dissipated just as it makes sense for investors to give money to the better managers until returns are driven down to the market return. Excess returns may exist but may not have persistence because the money flows will drive returns back to the industry average. A competitive market where excess returns are driven out through the normal process of supply and demand can answer a lot of money management questions. Small managers do better - flows or size have not forced profits lower. Larger firms show less profits - flows have driven returns to the average; however, the past track record keeps money in the fund. Alpha is reduced over time - the competitive flows drive the alpha lower. If a manager wants to continue to show good performance, he housed limits the size of the fund, although this is may not be rational in a competitive marketplace where he supposed to maximize firm profits. The investor has to look for the out of the way manager, and be willing to leave the fund when it gets larger. The only way to stay ahead of the competitive process is to constantly look for new manager talent and switch after they get too popular. There has been more talk about rising commodity prices and that these markets are back after the end of the super-cycle. Granted commodities as measured by a broad-based index have been the best performing asset class this year, but there still is a shake-out occurring in the market. Capital expenditure have fallen in oil and natural gas and other markets have started consolidation, but there still has to be further adjustments to get a better balance between supply and demand. Just look at farm net income in the US as measure by the Department of Agriculture Economic Research Service (ERS). 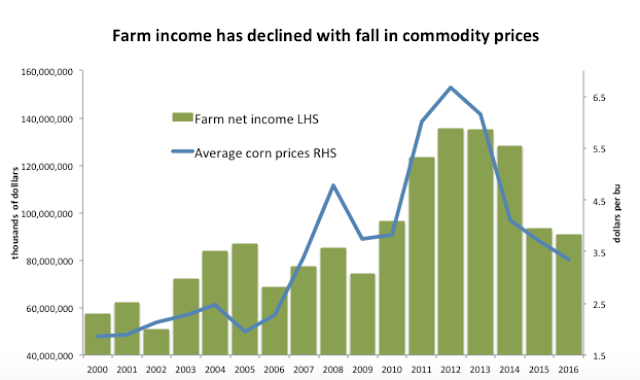 Farm income as fallen by 33% percent since highs in 2012. Land prices have softened and capital expenditures have declined. Any increases in the cost of production will further erode income which will affect the ability to increase productivity. 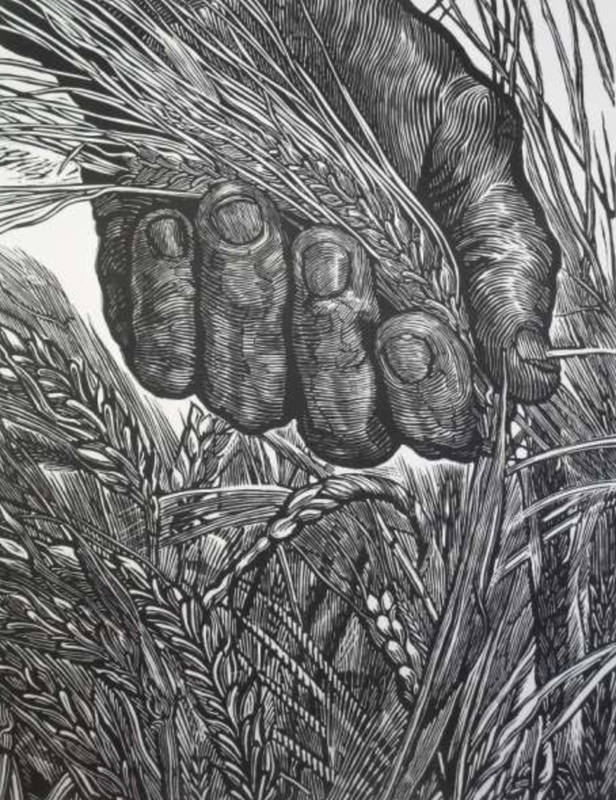 Farmer are still better off than from before the Financial Crisis, but their room to maneuver is diminished. Times are not great for farmers in the US. Jim Rogers is talking about counter-trend trading the market extremes. Buy when markets gap down on fear and sell when markets gap up. 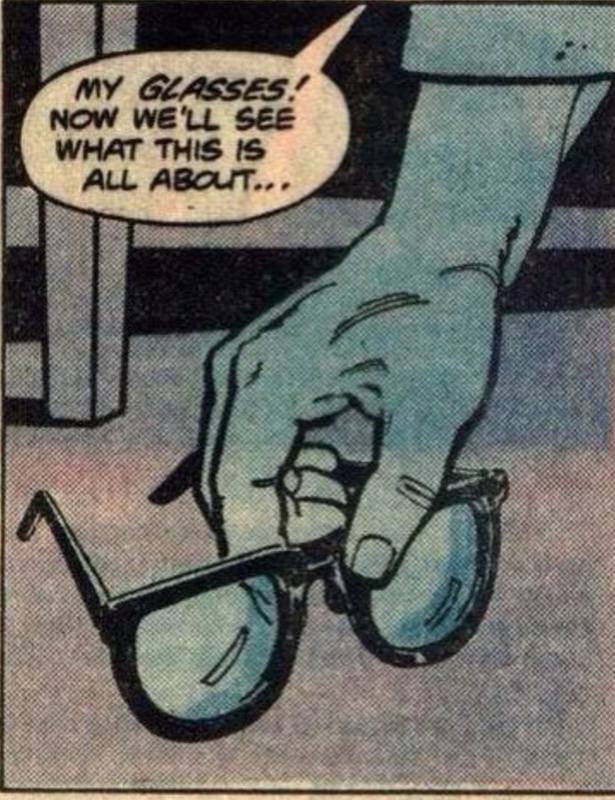 Look for excessive trends and then fade. According to the economist Herbert Stein, "Something that cannot go on forever will stop". I can add the corollary, "Anything that goes up much faster than normal, is likely to reverse with similar speed". Strong momentum makes traders complacent and lead to speculative excess as more investors try to get on the bandwagon and not be left behind for what seems like a good idea. Strong momentum is all the more suspect when the overall environment is inconsistent with the price action. You cannot have sustained rising price increases in a low growth economic environment. 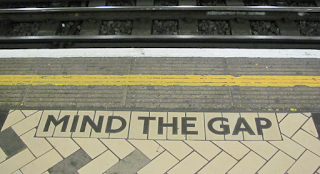 With 24-hour markets and global trading, market gaps are somewhat harder to measure or find, but the thought concerning market gaps still makes sense. Trend-followers generally will always stay in trends, so trend-followers will be able to exploit the build-up of greed and fear. There is no reason to cover long or short positions that are above or below trend lines, yet there are defined measures of overbought and oversold. Too much of a good trend will sow the seeds for speculative excess and a reversal. This is the crash risk often discussed with momentum and trend strategies. The real difficulty for buying fear and selling greed is knowing the extremes. This is not as easy as most think. Overbought and oversold measures have spotty history. Additionally, an investor has to offset natural tendencies to avoid fear or risk and seek easy money with greed. Relative strength of momentum and tail risk measures are good starting points but the distribution of prices are all the more difficult to measure when there is a change in equilibrium prices. This is why most investors prefer trends and also why once the price reversal occurs there is financial carnage. So a simple rule is a good start for any action on exploiting extremes. 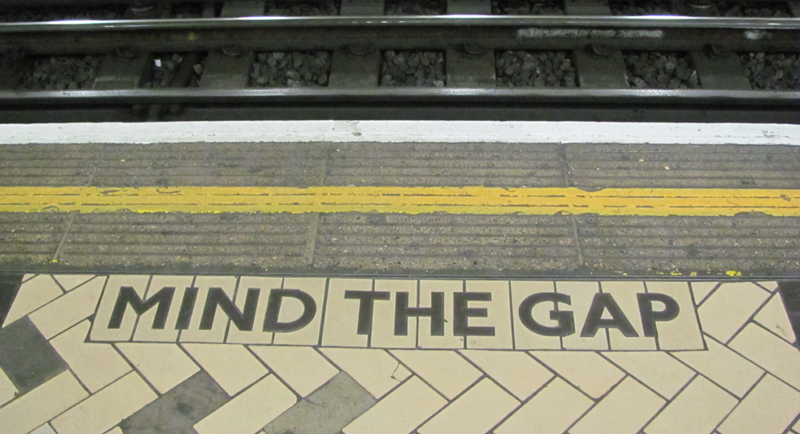 Price gaps are warning signs that require profit-taking as a minimum action. Risk is reduced with an opportunity cost of being early, but the cost of crash risk is minimized. 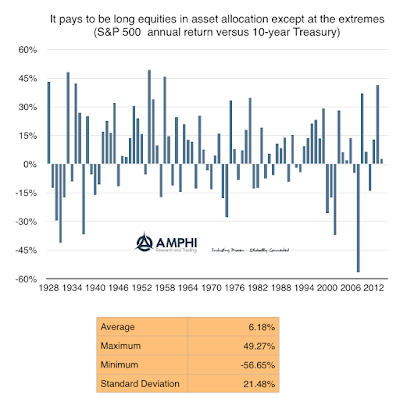 A long history of the difference between equity and bond returns helps to frame discussion on asset allocation. 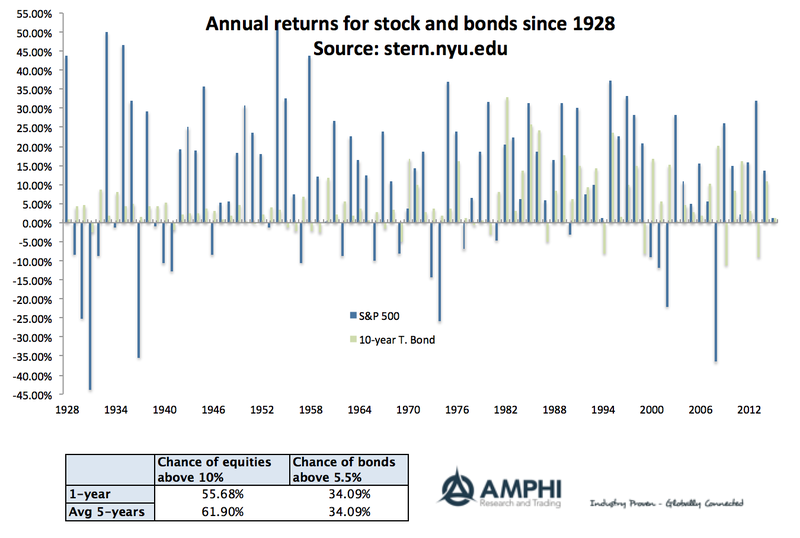 The table shows the advantage of equities (S&P 500) over bonds (10-year Treasury) since 1928 on an annual basis. The average excess return is just over 6%. Any higher equity to bond allocation will do better over the very long-run given the bias to a greater risk premium; however, the variation in the differences is overwhelming. One standard deviation is over 21%, so a one standard deviation event will range between plus 27.5% and -15%. The extremes are approximately 50% in either direction. The potential downside of holding stocks over bonds was over 50% in 2008, the worst single year of underperformance. Getting the stock/bond allocation wrong can wipe out any alpha generation. Assume that the alpha from hedge funds could be anywhere between 3-5% as measured by some academic research. A 10% allocation to hedge funds will add about 30-50 bps to performance from alpha, A 10% wrong allocation between stocks and bonds will cost 60 bps on the entire portfolio. You can add hedge funds and offset any of the risk from underweighting stocks versus bonds. 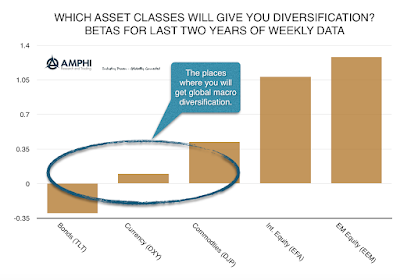 Nevertheless, it is more important to look at the variation between alpha and asset class allocations. 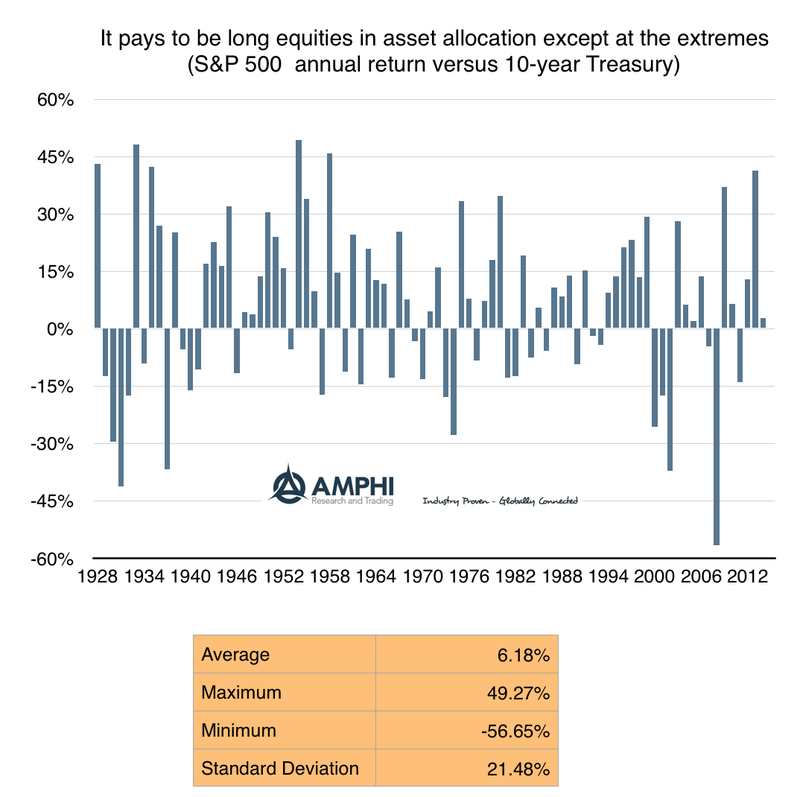 There is less variation in alpha, perhaps 150-250 bps or on average 20 bps per 10% allocation. The standard deviation from being wrong on the stock/bond allocation is easily over 200 bps even on a 10% mismatch. The risk of being wrong on the stock/bond allocation is orders of magnitude higher than the risk on alpha production. You need a lot of alpha to offset the risk from being wrong on your asset allocation decision. It thus makes sense to spend extra time on what should be the optimal stock bond allocation. On the surface this is impeccable logic; however, the question is whether managers have better skill at picking losers overs winners. We can marshal evidence that shows that this is not as easy as many would think. Many hedge funds have sold over-valued names and bought cheap only to have the pairs do the exact opposite of what was expected. Finding what to avoid may be as hard as picking the winners. Minimizing the maximum loss is never a bad strategy; however, it is the operational details that often make this difficult. This is one of the reasons for momentum and trend-following strategies as a simple way to employ the min/max strategy of avoiding losers. For a long-only trend-followers, the losers are avoided by not holding anything that is not going up. For the long-short managers, short losers can add to performance. For momentum strategies, the investor will hold the top names as measured by past total returns and short the names that had the poorest performance and avoiding the rest. In both cases, the approach is simple - follow what the consensus of capital is telling the market. Poor performers will continue to be poor. Obviously this cannot continue forever, but it can be a starting point for construction. A simple addition is to avoid those names trending lower and buy those trending higher is to sort based on some valuation criteria. Buy cheap up trends and sell expensive downtrends. At the very least, using a trend sort provides a good Bayesian foundation for any decision. If my priors are telling me to avoid, then only buy if there is new information that will offset current price evidence. One of the leading exports from Japan and Europe to the rest of the world has been negative rates. With both regions solidly negative and trillions of debt outstanding with negative yields, the pull to zero for the rest of the world is strong. Whether central banks or private investors, there is continued demand for positive yielding assets as a store of value and simple carry trade. Central banks are not stupid with respect to running their core portfolios, they want to hold yield and are thus buying Treasuries. Money will flow to safe positive yielding assets. The Fed has lost control of rates to the degree that any increase will make the US even more attractive to foreign buyers which should further increase the value of the dollar. This will hurt US exports and place more pressure on the loan books that have been dollar funded. The last surge in the dollar pushed EM financial asset lower given the difficulty of many banks/investors to manage their dollar liabilities. A stronger dollar has negative global implications. The current spreads on dollar asset are still high as measured by the difference in 10-year spreads since 2009 for leading DM rates. 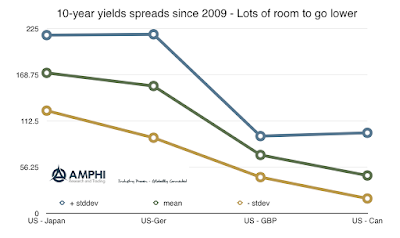 There have been times since 2009 when these spreads were negative with the acceptation of Japan. 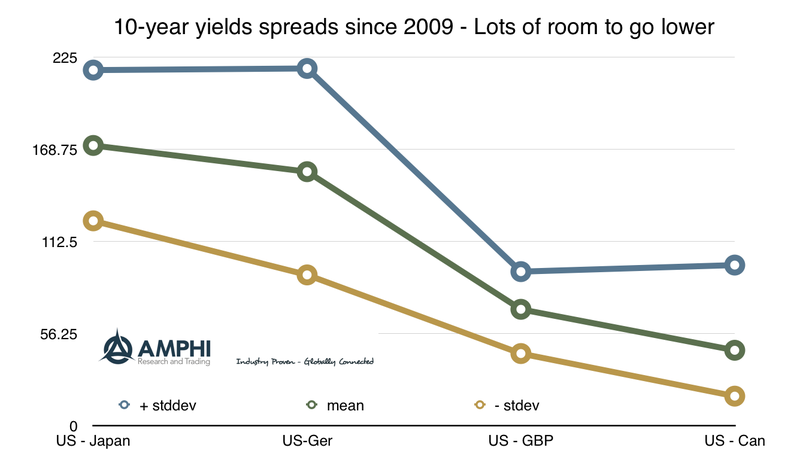 A one standard deviation move lower in spreads will still have US rates close to 100 bps or more in both Japan and Germany, and spreads versus the UK and Canada still positive. Money will still flow to the US. The growing global progression to negative rates will continue to downward pressure US rates. One of the few mechanisms to stop these capital flows is capital controls which would be a surprisingly strong policy move by any developed country. There is little that can stop this demand for safe positive yielding debt. If you want an equity hedge for the portfolio, don't look at other equity markets. The major asset classes for diversification are bonds, currencies, and commodities. These are also the big three for managed futures and global macro. A hedge fund that stays in this space will be in good shape with respect to any diversification benefit. The long bond has been the "great diversifier" in the post Financial Crisis period. This has not always been the case, but bonds have done better than most other asset classes as a mechanism for hedging equity risk. Looking at correlations across asset classes against equities since 2009 shows a wide difference between high and lows especially for bonds, currencies and commodities. All three have moved between positive and negative numbers. These asset classes offer diversification but the value can be highly variable. Using these asset classes as diversification tools may require active adjustment based on the changes in correlation. 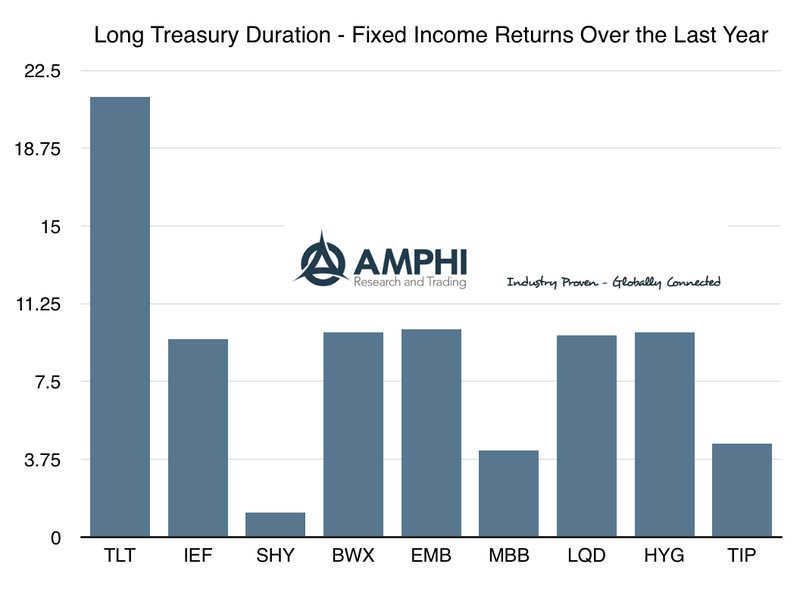 Fixed income performance - It is all about duration - "Gimme that yield "
It has all been about duration in the Treasury market that has driven fixed income returns over the last year. It has not been about credit, albeit it has been on a wild ride. It has not been about diversification in developed and emerging market bonds although the declines in the developed world have been unprecedented. It certainly has not been about inflation protection, albeit it the returns for TIPS have not been bad. With SPY showing a 5.87 percent return for the last year, fixed income for anything beyond 5-year maturities have bested stocks. 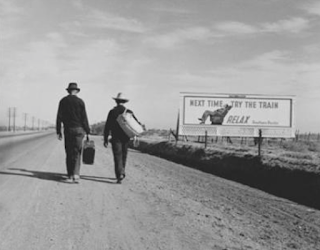 The long duration play has occurred in a world where the Fed has decided to hike rates. Inflation is stable to moving slightly higher, unemployment has moved below 5%, and 10-year yields have moved to multi-decade lows. A Taylor Rule model would suggest that rates should much higher, yet buying long bonds has been the big trade. The market could be telling us that a recession should be coming, but the the chances do not seem especially elevated. There could be a flight to safety as evidenced by the strong Treasury showing the gains are especially concentrated on the long-end of the yield curve, but there has not been a corresponding increase of merit in the dollar. Perhaps the bets story is a shortage of high quality fixed income. In a search for yield, investor demand is significantly outstripping supply. Still, this is not what most would have expected a year ago. "...you go to war with the army you have---not the army you might want or wish to have at a later time." There are a lot of complaints from managers about the poor investment environment. Interest rates are distorting markets. Central banks are manipulating rates. There are asset price bubbles. There is too much market uncertainty. Yet, this is the world we live in and invest for. The manager has to battle the markets with the tools that are available although they don't have to be used in the same manner as the past. I have always been a believer in using as much data as possible, but in this environment using long-term data prior to the financial crisis may not always be appropriate. The world was different. This difference is why it is important to use other decision-making tools to focus on specific situations of today. The use of cases or specific situations that may fit the current environment may be extremely useful. For example, with respect to the housing bubble in Canada, we can compare and contrast with other housing bubble events. There are similarities. 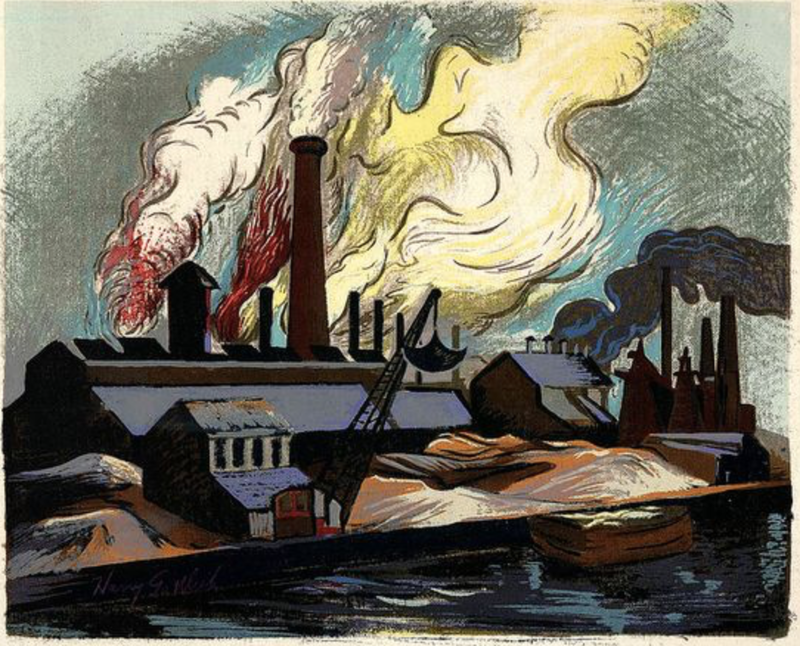 Current bank crises can be contrasted with crises of the past. 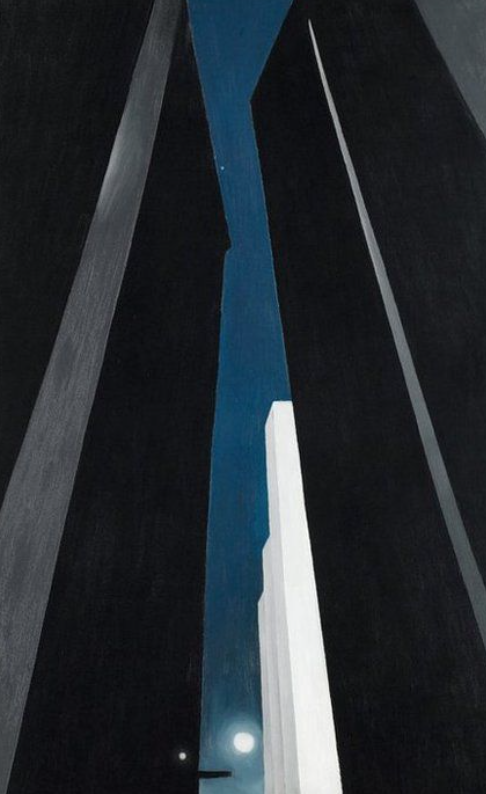 The key to this type of work is looking for both similarities as well as differences. Find uniqueness after looking for commonality. Another alternative is the use of scenario analysis to draw impression of the future. A perfect example would be the scenario if rates go negative in the US. We have evidence from other countries and the threat is real. The impact will be different than just a rate decline. Clearly, using cases and scenarios as an investment tool is not new, but in a strange environment, they are all the more useful. Everyone talks about alpha, but there is often a shortage of explanations for why alpha exist. I am not talking about the problem of measurement of excess returns after accounting for beta, but the reason for why there can be excess returns in the first place after accounting for risk premiums. A simple framework could divide the rationale for alpha into two schools or world views. One can be called the structural school and the other the behavioral school. 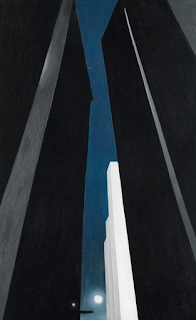 The structural school can also be called the limits to arbitrage view. 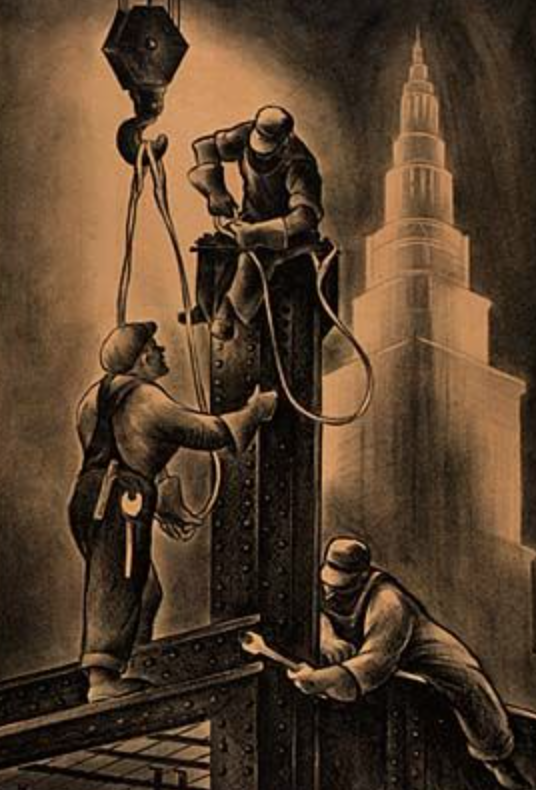 In the structural school, markets will be efficient except for structural impediments. The structure of markets will affect their relative efficiency. Those managers who can offset these structural impediments will be able to profit and generate alpha. The behavioral school states that managers are able to generate alpha because they can take advantage of the behavioral biases of others. Those with behavioral biases, sometimes classified as noisy traders, create market inefficiencies if they represent a sizable amount of trade volume or capital. 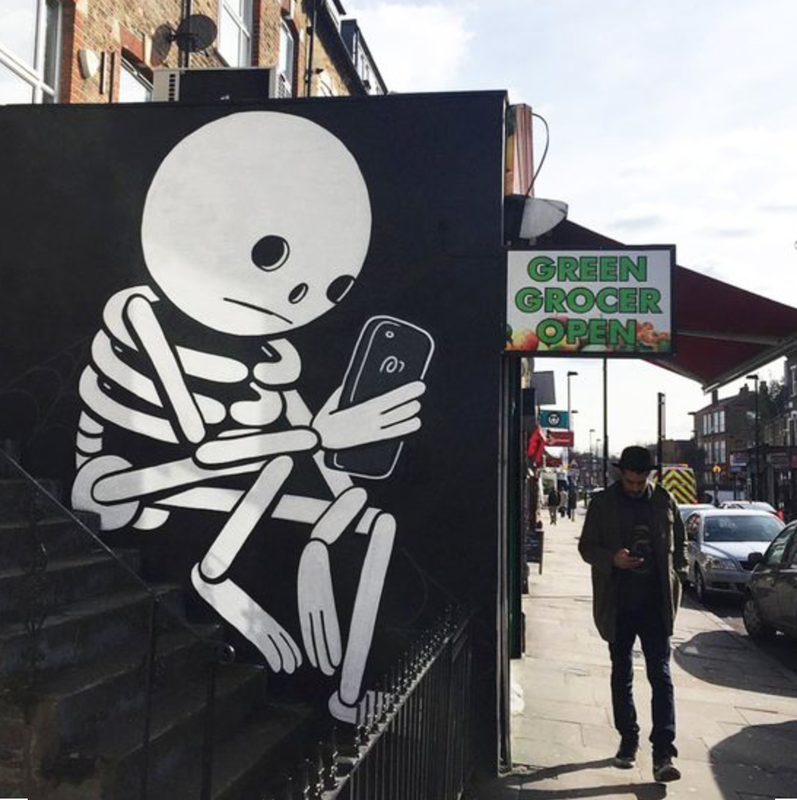 Prices may not immediately reflect information or overreact to news. The skilled hedge fund manager identify these market situations and will take advantage of these inefficiencies for gain. The structural school leads to some clear ideas on where alpha can be found and exploited. It would be very hard for alpha to be generated in the most liquid markets which are followed by many analysts. There are no barriers to entry or trading so market competition eliminates any excess returns. Money can be made in those markets that are less efficient and may have barriers to competition. It could be complex securities that require specialize skills. It could be those markets which have higher transaction costs for most other traders. It could be markets that do not have large amounts of capital committed relative capital demanded or markets that have specific legal or regulatory restrictions. Nevertheless, if the structure of the market changes, excess profits could be eliminated. The behavioral school needs ongoing behavioral biases from a sizable amount of other traders. The skill of the hedge fund manager comes from his ability to see or identify these biases in others or in a particular market and exploit them. The bias could be a market over-reaction or under-reaction to new information. The hedge fund manager may understand the value of a market and trade when biases lead to deviations from fair value. The bias could be situational as opposed to an ongoing structural issue. These biases could be ongoing, but also change with the market environment. More liquid markets can still be subject to behavioral biases. 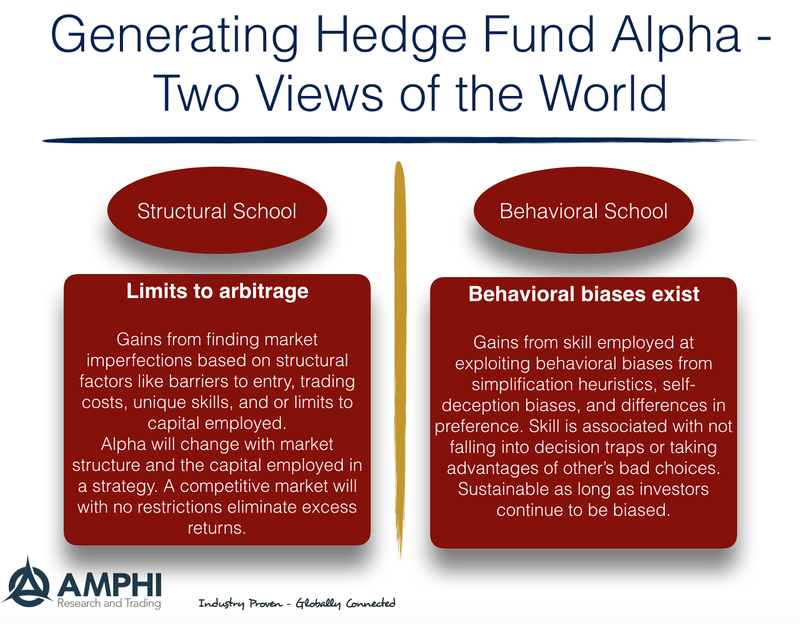 Hedge fund managers may not be exclusive to one school or another and there may be other ways to classify alpha, but placing broad structure around the identifying characteristics of alpha may help define the advantage of some managers over others. SSGA survey - why are investors optimists? The latest SSGA survey has come out with the return expectations of institutional investors. The survey provides a good perspective of what investors are thinking about a number of investment issues including their views on future returns; nevertheless, I am surprised at the long-run returns expected by investors. They think equities will generate 10% returns and fixed income will come in at about 5.5%. In these elevated markets and with current global uncertainty, these investors are being optimistic. 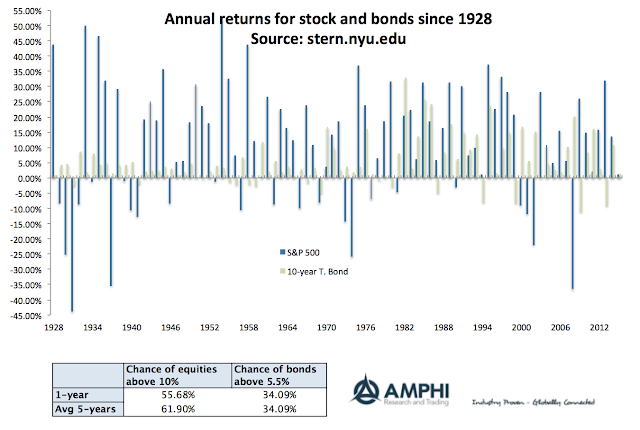 We can have that view by looking at the returns for the S&P 500 and 10-year bonds since 1928. There is a greater than 50% chance of equities being above 10% in any one year and a greater than 60% chance of averaging above 10% in any five year period. Assuming a 10% average is not out the realm of possible. For bonds, there is only about a 1/3 chance that fixed income will be greater than 5.5%. This is not accounting for the fact that rate levels are extremely low. The carry on the 10-year bond is now below 1.5%. The fixed income view seems very optimistic. The equity and bond expected returns are optimistic but could still be considered likely, but the overall portfolio returns are expected to reach 10.9%. Assuming a 60/40 stock/ bond mix and using the survey expectations for each asset class, the expected portfolio return would be 8.2%. This means that through asset selection and dynamic portfolio adjustments, investors believe they can add 270 bps of alpha. Again this is possible but will require significant returns from alternative investments. The alternative portfolios will have to add both beta and alpha to help reach the overall expected goal of the portfolio. Perhaps managers know something special, but these numbers look more like a extrapolation of the past than a careful judgement of the future. 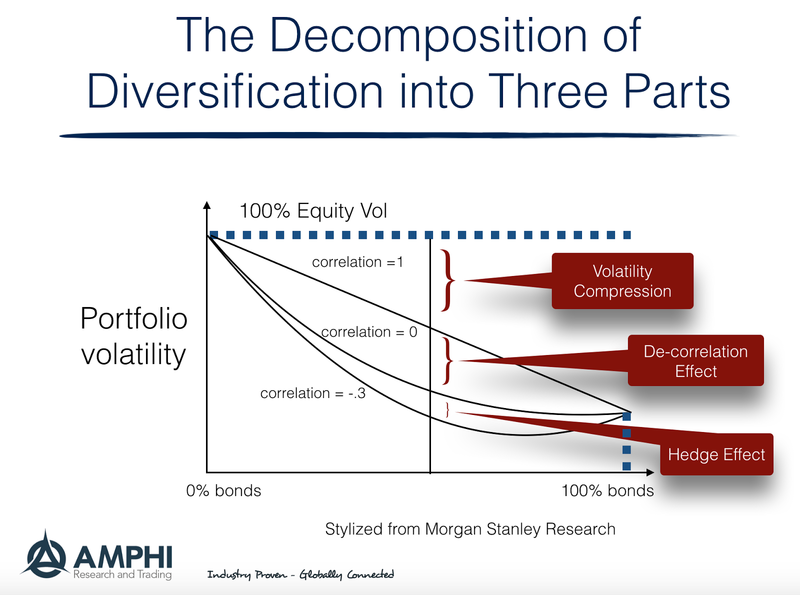 An interesting perspective on the benefit of diversification focuses on decomposing the gains into three parts. 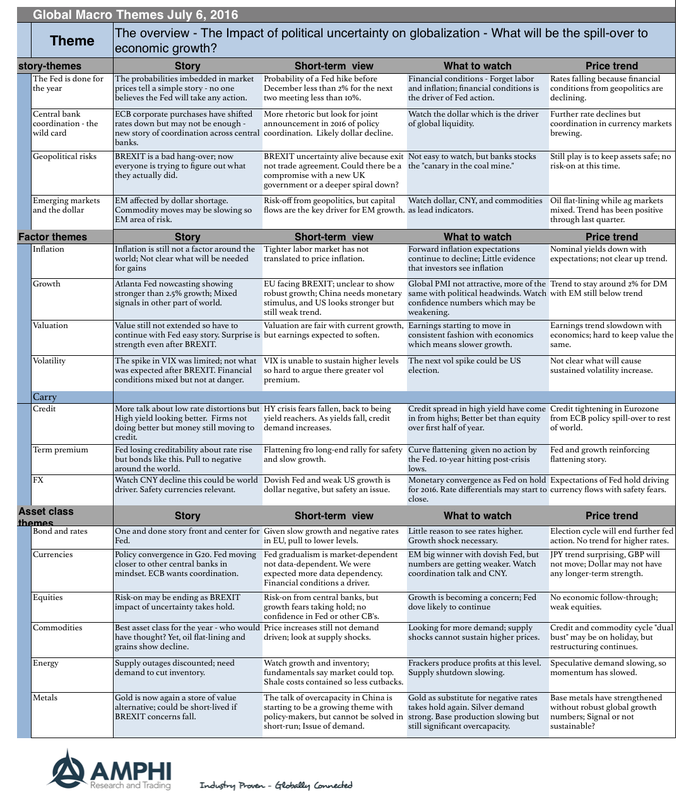 As presented by Morgan Stanley Research, this is a framework that will be useful for any investor. It is just a recasting of the mean-variance frontier with a focus only on the volatility benefits. Looking at the decomposition of volatility reduction is just another way of looking at the volatility of a portfolio with different weights between two assets while accounting for the impact of correlation. It is especially helpful for discussions concerning the value-added of hedge funds. Let's take the simplest example of a combination of stocks and bonds. Assume that you have an all equity portfolio and you would like to add bonds. As you add bonds to the mix and switch out of equities, the volatility of the portfolio will decline until you reach the point where the portfolio will have the volatility of bonds. This would be the 100% bond portfolio. Those two extremes anchor the volatility in the portfolio. The volatility of the portfolio will be a combination of the volatility of the two assets and their correlation. The decline in volatility from forming a portfolio of stock and bonds versus holding 100% equities can be divided into three parts. One is the change in the volatility based on the addition of the new assets assuming that the two assets are perfectly correlation. The decline in the volatility of the portfolio could be called the volatility compression. You can get diversification, that is lower portfolio volatility, by just substituting with assets that have lower volatility. The reduction is proportional to the amount of held. There is a second effect which is the amount of risk reduction that is caused by de-correlation or the lack of correlation between the two assets. A more uncorrelated asset will lead to greater or enhanced diversification relative to just buying the less volatile asset. For most assets, this will be the extent of risk reduction. However, there can be a third effect which is the impact or the added diversification from buying an asset which is negatively correlated with the portfolio. This is the hedging effect because negative correlation will actually offset some of the existing volatility. These are the assets that are especially valuable for diversification. Bonds can generate all three effects when added to the portfolio. Bonds are less volatile than equities. 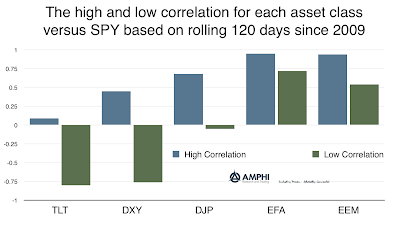 There is a de-correlation effect and the added effect of it being a hedge versus equities. Hedge funds have not done as good a job as bonds for diversification because they have not been able to generate the hedge effect. Hedge funds are less volatile than equities, and have lower correlation but except for managed futures and short-selling funds, the correlation is usually between 0 and .5, at best. The hedge effect is volatile and may not continue with bonds, but right now it is what has made bonds a special asset. Investors have to look for the special managers or assets that can have a hedge effect on a portfolio. Interest rates continue to march lower, yet banks are in worse financial shape since rates have turned negative. Banks can pass stress tests but the market is saying that their value is deeply declining. The recipe for helping an economy has always been to lower rates and thus help banks through allowing for wider spreads and cheaper funds. That does not seem to be working. Now, it could be an issue of false causality, but banks are in bad shape and rates will not solve the problem. Of course, policy is at cross purposes. The monetary authority side of central banks are lowering rates to stimulate economies while the regulatory side is trying to reduce bank leverage and control any "excessive" lending. These goals are in conflict. The gates on UK property funds are ominous. Gates on mortgage funds were one of the first signs of the Financial Crisis. Yes, this is a different situation, but when liquid investments turn illiquid, investors will start to take note and search for safe solutions. The "bubble-like" levels for utilities is fully expected but still startling. A safe utility has a higher average P/E than risky tech firms and the market as a whole. Of course, low energy prices have helped utilities, but this is a recipe for investor disappointment. The US may not be as big an energy importer, but it may now be a big importer of lower rates. 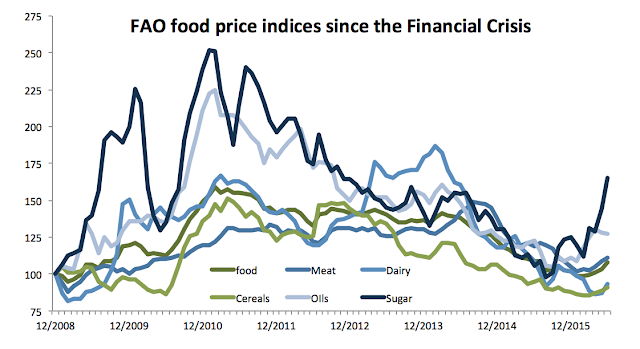 Longer trends in agriculture prices can be found through following the FAO food indices. As an aggregate of global cash prices and not just futures, it provides a broad measure of food costs around the world. The evidence shows that with the exception of sugar food prices have been relatively tame since the Financial Crisis. Food prices have not followed the behavior of financial markets. While there have been some common food price themes such as the gains in 2011 and the subsequent fall, it looks like there has been a bottom for food prices except for dairy. Cereal prices are back to levels seen at the beginning of 2009. Meats, oil, and sugar are all headed higher. The wildest ride has been in the sugar market which has seen similar moves to crud oil and has gained more than 50% in the last nine months. 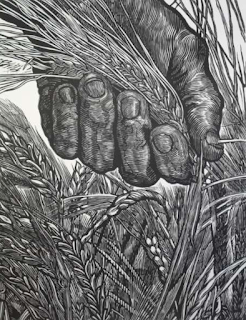 Food volatility is driven by climate supply shocks and market specific dislocations, but there is enough cyclicality and movement with global growth to suggest that there may be room for market upside. 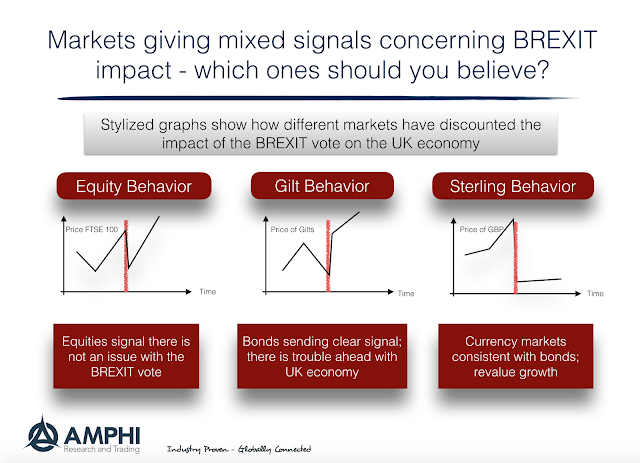 Post-Brexit uncertainty will hang over the markets which may not allow for strong risk-on behavior. The fall-out with policy is simple. The Markets view the Fed is on hold for the rest of the year. We are in a "one-and-done" world. Markets are in transitional phase between BREXIT and US presidential election. 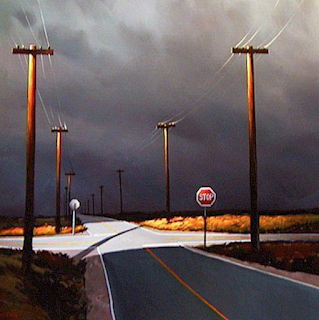 Both these events create a veil of uncertainty that dampens trading. What is clear is that globalization is under assault. Trade growth has slowed by half since the Financial Crisis. The engine of trade will not be a solution to global growth. This will impact equities, fixed income, and commodities. This theme is not something that generates short-term trades but it is a headwind that will limit the upside for risky assets. The power of divergent trading is evident when there are large market dislocations. Under market stress or crisis, longer-term trend-followers will outperform short-term traders. This was the case in June. 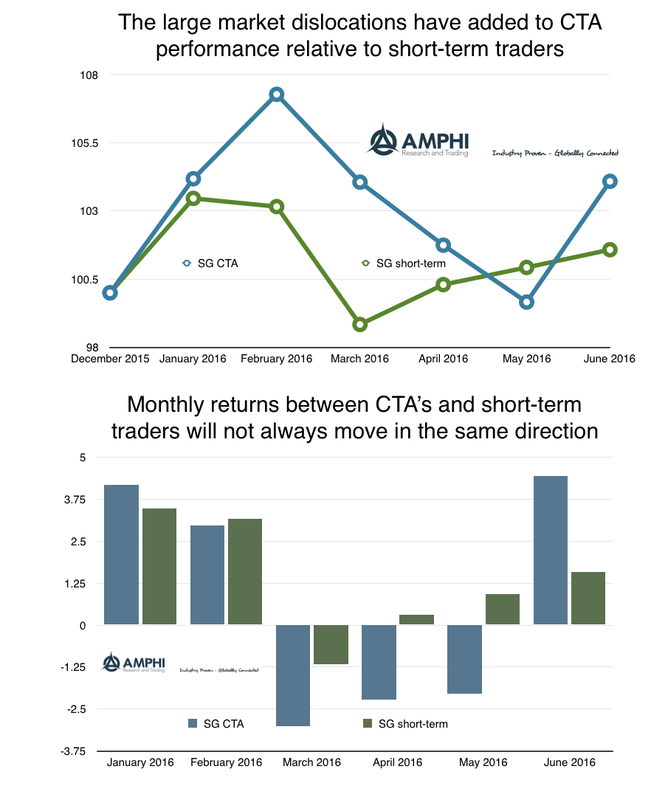 Both CTA's, which mainly consist of trend-followers, and short-term traders made money during the turbulent month of June, yet the extended trends especially in fixed income allowed the longer-term traders to generate higher returns. This was also evident in January when there was the significant equity sell-off. During the middle period, March through May, short-term trader were able to still make money in a more trundles environment. It is hard to predict when trend will appear so active switching between longer-term and shorter-term trying is difficult, but a mixed strategy of holding both will provide significant diversification benefit. Many hedge fund strategies were able to weather the market upheavals in June. The biggest index winners were systematic CTA's followed by market directional strategies. 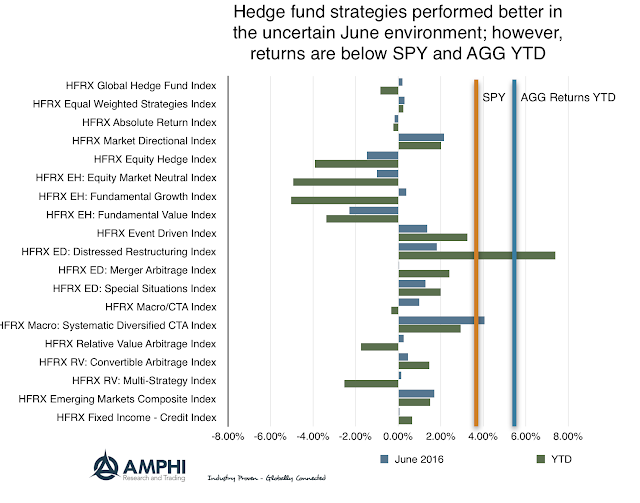 Nonetheless, equity hedge fund strategies indices like market neutral, fundamental growth and fundamental value all continued to underperform. This has not been a stock-pickers environment. Equity and bond markets faced significant increases in uncertainty around the globe but were still able to generate positive returns. However, the equity returns out side the US suffered declines of over 2.75 for the MSCI world index (EFA). 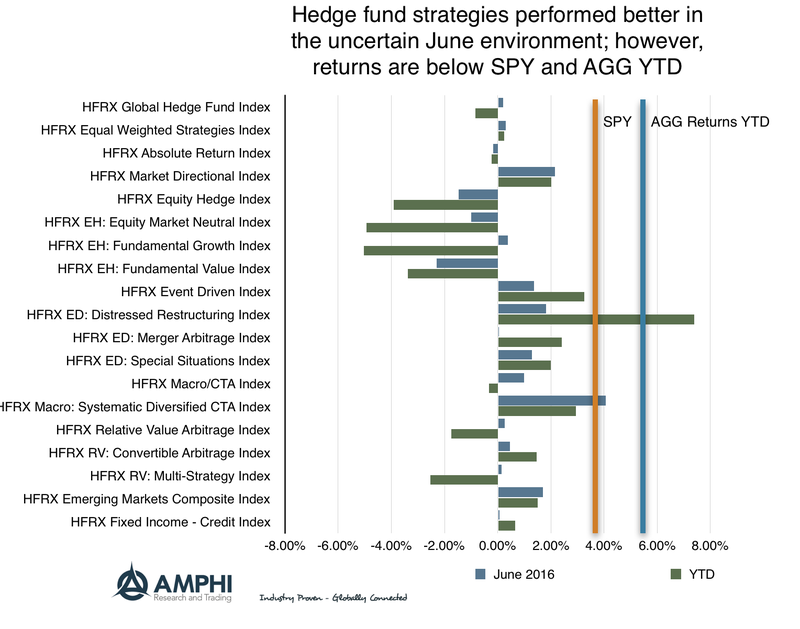 There only hedge fund index that was able beat SPY and the Barclays AGG was the distressed strategy. The next best year date winner s were CTA's and event driven strategies followed by merger arbitrage, special situations, and market directional strategies. This has not bee a good year for hedge funds with big moves coming from macro events. With BREXIT still unresolved after the June vote, a US presidential election, and more monetary policy uncertainty, finding alpha may continue to be difficult in the second half of the year. We have been members of the "one and done" school of Fed action for 2016, but I don't think anyone could have anticipated the change in market perception in the last week. 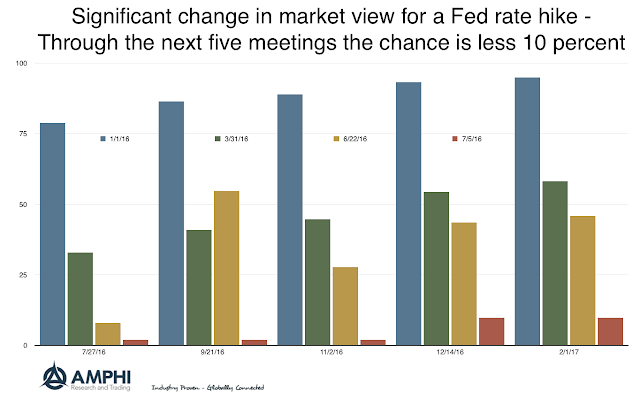 There was a clear consensus that the Fed would raise rates during the year, but by the end of March the view was at best a coin flip for the end of the year or early 2017. Now, post-BREXIT, the chance is only 2% between July and December and less than 10% for December or February. Fed action is now off the table. 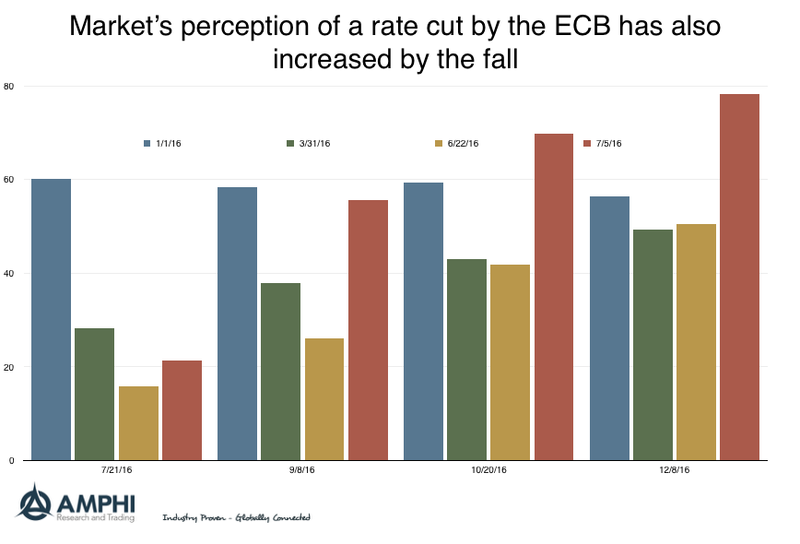 There is a strong view that the ECB will be cutting rates in the fall. 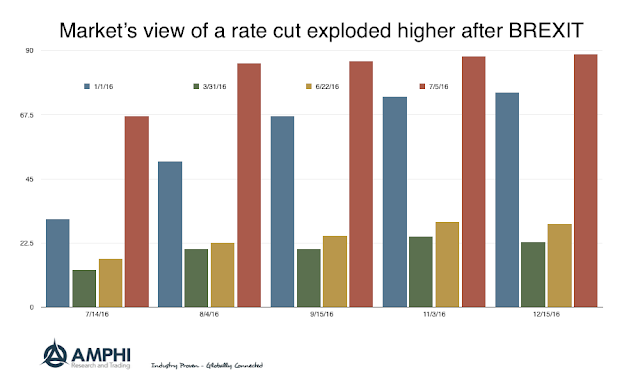 The numbers are slightly distorted at the beginning of the year since the ECB took further quantitative action which lowered rates in the spring. There was a clear jump in the last week. The ECB will support the EU. The January probabilities are for a hike by the BOE. Since March there has been a switch to a rate cut and those probabilities exploded after the BREXIT vote. In an uncertain world, the only policy choice by central banker seems to be to lower rates through any means possible. After a strong first two months of the year, managed futures gave back gains and started to disappoint investors. I include myself in the crowd that questioned the ability of managers to hold gains. Well, investors has to eat their words with solid gains for managed futures following the BREXIT vote. Trend-following is non-predictive in the sense that you cannot forecast when there will be market dislocations and you cannot predict when trends will occur. Signals are identified, action is taken, and returns are generated until the trend is exhausted. There is skill in trend identification and management, but this is not the same skill as those managers that fancy themselves as predictors or forecasters of future market behavior. The more "humble" trend-followers just try and find an existing trend and act to extract some of the price movement. No trend-follower predicted the BREXIT vote. 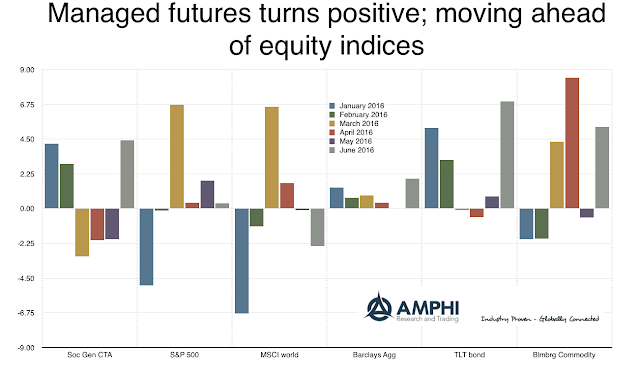 My guess is that some may have been on the wrong side of equity moves, but for the trends that occurred they exploited regardless of votes or predictions. The usual strong fixed income exposure was a fund winner. Managed futures have moved ahead of equity indices and the broad bond aggregate for the first half of the year, but there are still some disappointments with performance. 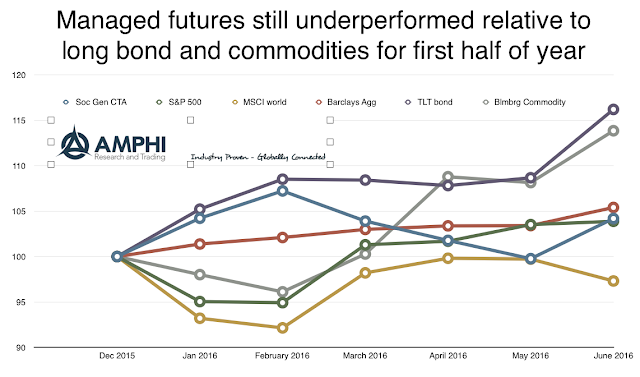 Looking at the strong bond and commodity moves this year suggests that diversification and variable long and short positions actually dampened returns. Assuming close to 50 percent or more exposure in fixed income and commodities means that equities and currencies were negative contributors to performance and active trading placed a drag on gains. 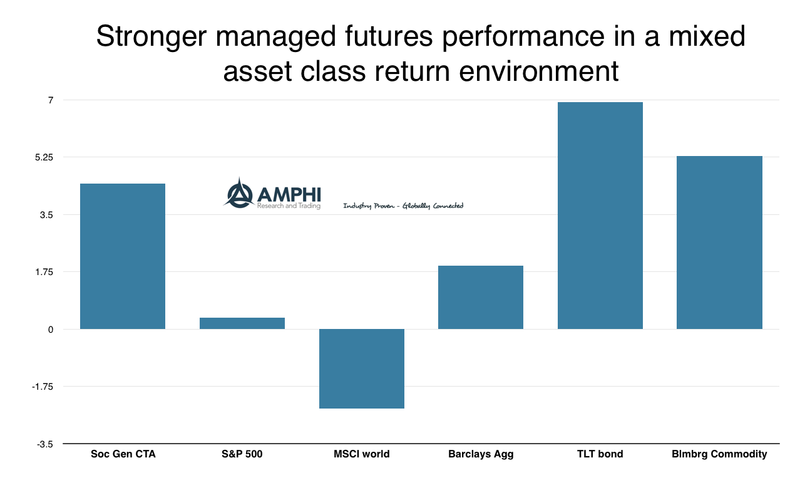 Nevertheless, managed futures has done well versus many other hedge fund styles. One week after BREXIT the markets are sending clear price signals on what investor think. It may not be exactly what anyone would have expected and the signals differ based on the market. Someone is going to be wrong and the odd market is UK equities. Bonds - The signal is clear. There has been a flight to safety in fixed income mixed with expectations of an economic slowdown and easing by the Bank of England. The strong trend made this a trade that most benefitted investors. The fear of uncertainty crowd was rewarded. Currencies - The impact on sterling was consistent with bonds, poor growth tied with central bank easing as a stop-gap. However, the market was caught leaning to remain before the vote and was surprised after the results. There has been little positive bounce since the vote. Equities - Here the story is more complex. The FTSE 100 actually reversed the loses from BREXIT. If you fell asleep and just saw the end of month levels versus the pre-vote levels, you would assume that the vote was to remain. The equity market as measured by the FTSE 100 index is out of step with bonds and currency markets. It seems that bonds and currency traders have priced in continued uncertainty with a negative bias to future UK economic growth. Managed futures trend-following was winner in June for have large bond exposures. The trends have been strong, unambiguous, and showing no signs of decelerating. 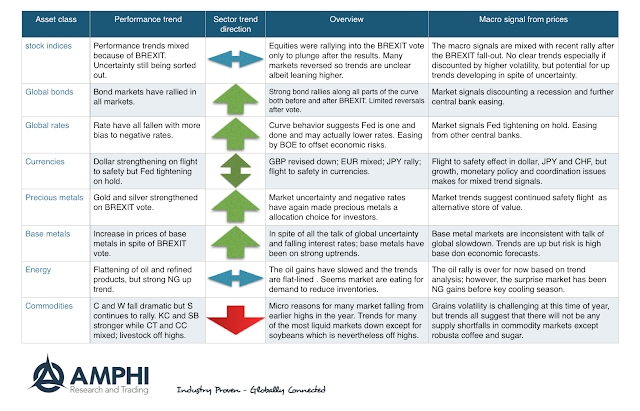 A review of trends across all major market sectors shows strong up moves across many markets. We use a combination of three moving averages )short/intermediate/long-term) to determine the sector direction. Stock indices are mixed but last week's trend are pointing to an up trend; nevertheless, long-term trends are flat. Bonds and rates are showing strong rallies around the globe. Precious metals are moving higher as well as base metals which seems surprising given the bond moves. Energies are mixed with the exception of natural gas and commodities are headed lower except for those markets whose supply if focused on Brazil. Given the strong performance in June and the clear potential for the continuation of trends, there is the opportunity for further gains from trend-following. 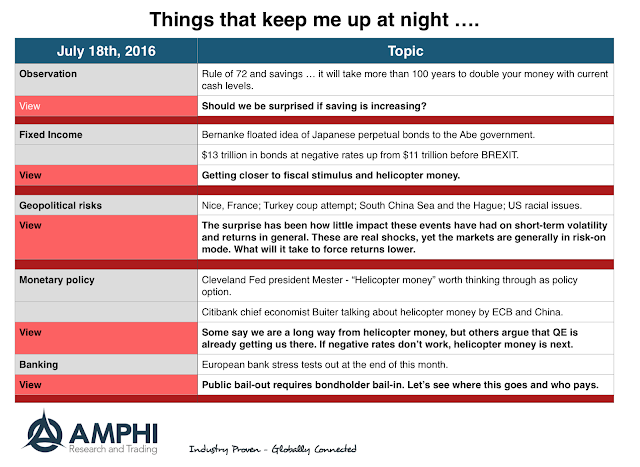 The biggest surprise was not the decline after the BREXIT vote, but the rally in a still uncertain world. Uncertainty or ambiguity should lead to more risk avoiding behavior yet risky markets bounced back last week. Conflicting signals on how BREXIT will be resolved and politicians that have been trying to score points for their views leads to a world that is more uncertain. Nevertheless, there are other issues that will keep me up at night. The biggest issue is still growing leverage with non-financial companies and negative rates. Higher leverage will increase risks when there is a downturn. These are the seeds for future problems.